North State Solar Energy has been selected to complete the West Valley Ace Hardware project in Cottonwood, California and the Valley Ace Hardware in Redding, California by Todd Martin and his son Remington Martin. More to come on the project details soon!" A solar system is a 25 year investment, so we install only the highest quality American Made products. We help homeowners and local businesses reduce their overhead costs so they can focus on what matters most. It’s a 25 year promise to our clients, 25 year worry free guarantee, 25 years on components, and a 25 year power guarantee. That’s how we do business. Click on the picture to watch and hear what our Customers say about our warranty. 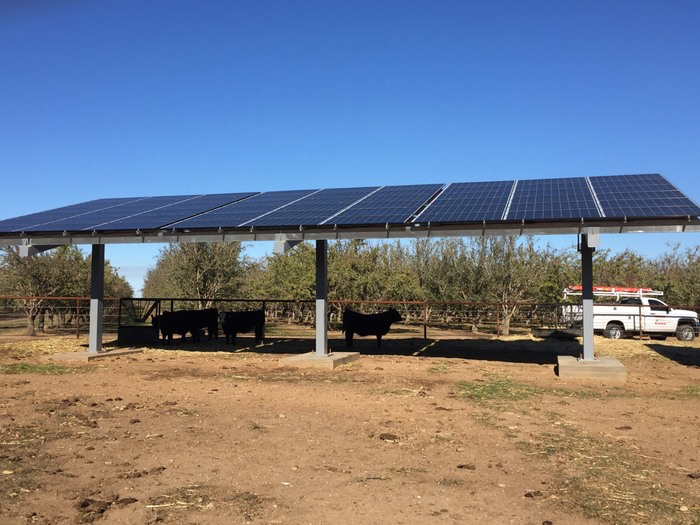 Carillo Farms had a first experience in solar with another (unnamed) company that installed a 20 KW DC project as a Net Energy Metering Aggregation (NEMA). The generator aggregated 3 meters – all with different tariffs. That project had several flaws that made it a big problem for Carrillo Farms. 1. It was grossly under- sized for the energy use load. The NEMA project was only capable of producing about 16% of the combined energy used by the three meters. 2. It used no system monitoring at all- and there was no record of production or performance. 3. The Chinese-manufactured microinverters began failing within one year and the owner did not have a method to determine or become informed about that problem. 4. The system was built using old (reclaimed) pipe and materials that were not suitable for a long- term service. Fortunately the modules were Made in USA, but the rest of the system was a big problem and a big loser for the farm. NSSE was hired to design a new system – removing the old system and preserving the modules, but all other components had to be replaced. The system increased in size by 80%. This provided the owners with an effective 100% replacement of the energy at the host meter and separated the other meters so that they can be properly sized for individual solar assets. NSSE added the Made in America Module 250 for this project – which was applied for before the Rule 21 change (the product is now unusable in California now since it cannot be accessed and curtailed remotely by the utility). 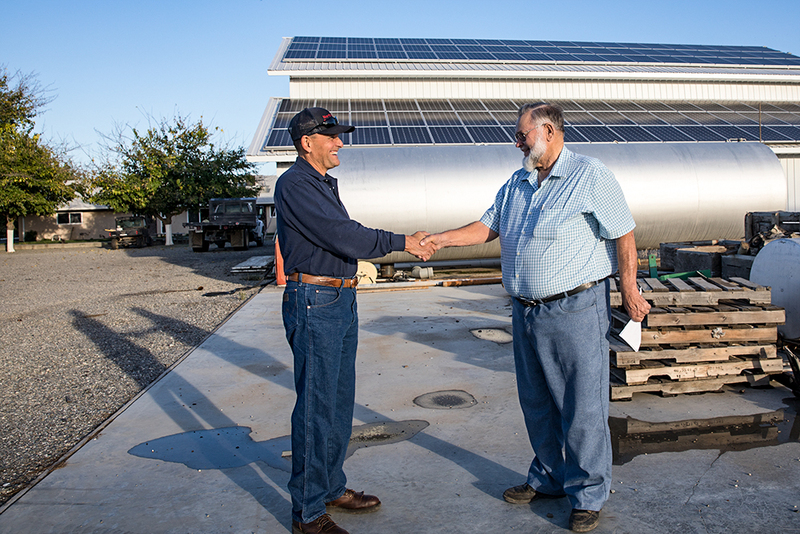 Fortunately for Carrillo Farms, this project corrected all of the major problems previously experienced using solar. 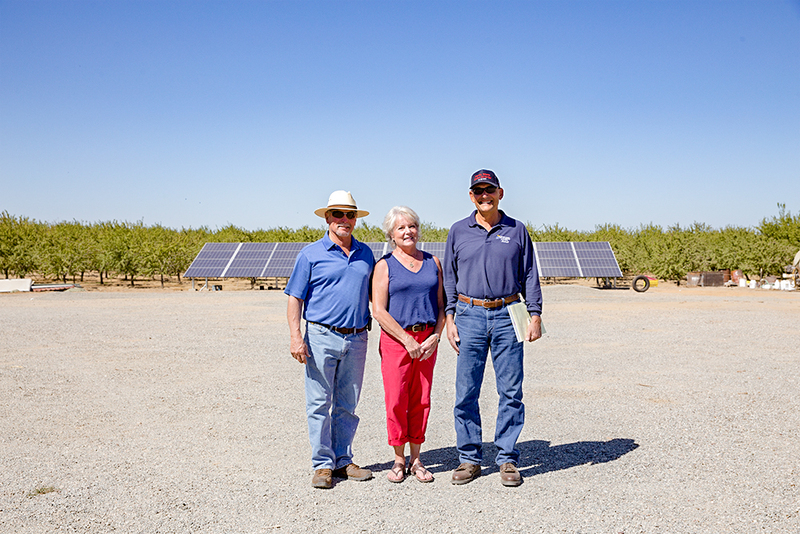 And, Carrillo Farms also hired NSSE to install an even larger solar array at a nearby orchard. 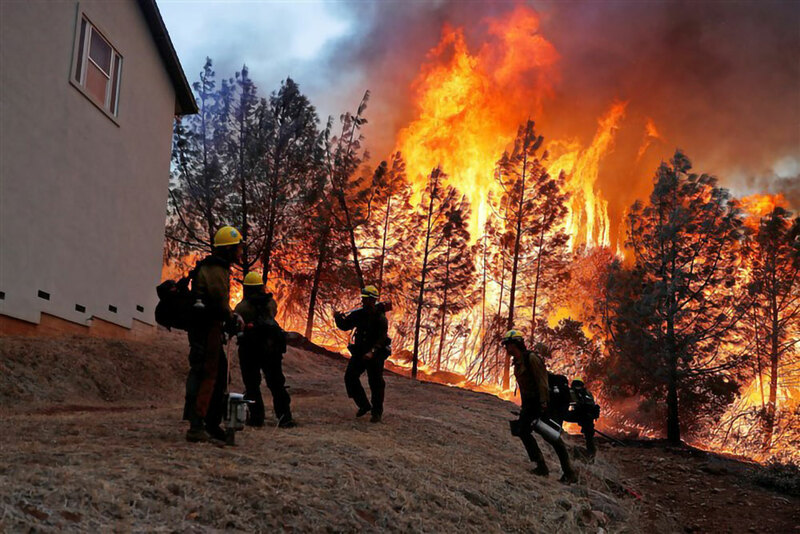 North State Solar Energy grieves with our entire region in response to the horrific Camp Fire and its incredible destruction. Several of our employees have lost homes and all their worldly possessions. But the worldly possessions can be replaced, and all our NSSE "family" is safe and healthy. NSSE continues to construct energy systems for our clients throughout the region and continues to operate even under these difficult conditions. It is important to NSSE that we provide the services as promised for our clients and that we keep our employees working and receiving a their "daily salt". We thank our many clients for trusting us to work for you and hope you will understand that we might have a few delays in communication or work as a result of the fire and evacuations. We also extend our condolences to our clients and community members who have lost loved ones and may be without a home at this time. Please contact us if we can help in any way." NSSE has performed 5 separate projects for GSA Farms totaling 219 KW DC in the period from 2014 through 2017. The most recent project is a 110 KW ground mount that serves irrigation pumps, and is expected to offset approximately $26,000 in annual energy costs for the pump works electrical service. 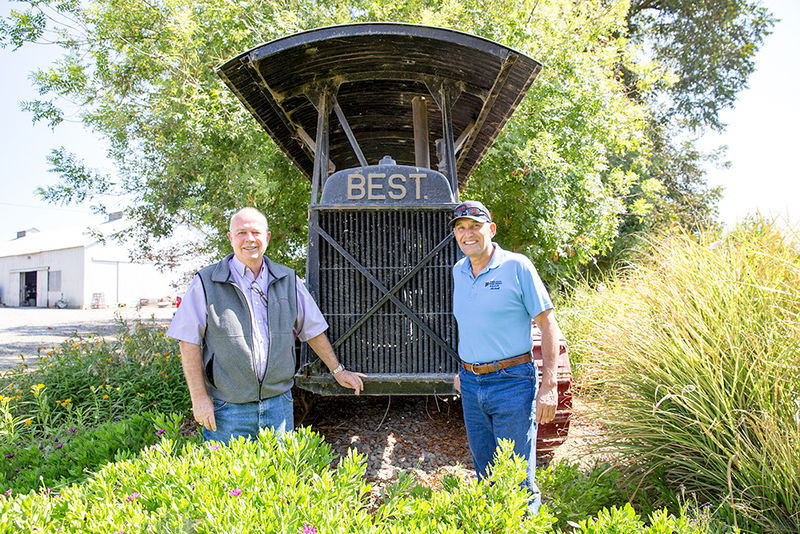 Gary Anderson is a hard working farmer who specializes in a combination of wheat, row crops and orchards in Glenn, CA, home to many outstanding California farmers. Gary heard about NSSE from other local farmers. NSSE has also worked for Gary's father and brother who live and work nearby. NSSE is grateful to have great clients like GSA farms and the Anderson family. The Anderson Heights 188 KW DC project is the first in a series of eight projects that NSSE will be performing for the Cascade Union Elementary School District in Anderson California. This sub-array project will product an estimated 245,000 kWh in year one of operation and offset an estimated $46,000 or more in electrical costs for this campus. Total project size will be approximately 1.1 MW and offset approximately $250,000 annually in energy costs for the district. NSSE once again has used only Made in USA components for this outstanding project. We would like to thank the School District for putting their trust and faith in us for this large project. Click here to see more pictures of the project. NSSE recently completed the 136 KWDC project for Moffitt Farms, of Gridley, CA. 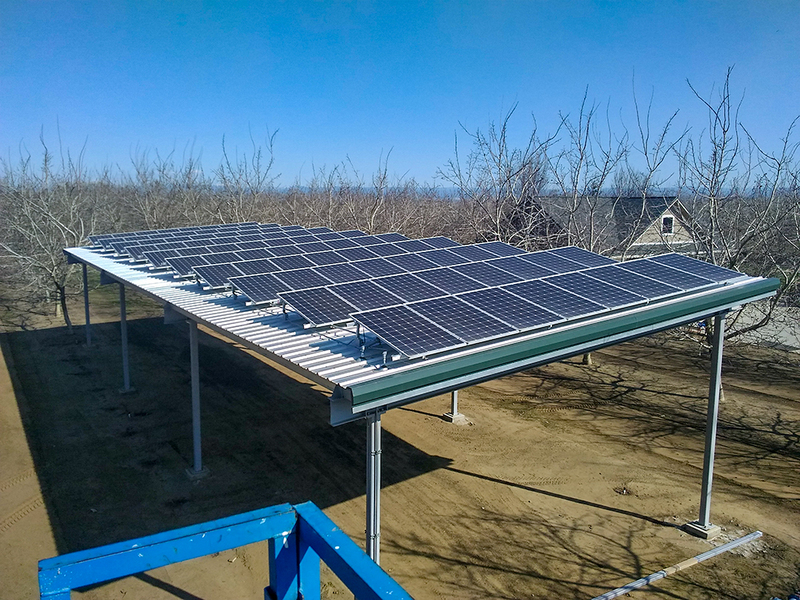 Clinton, Gail and Blaine worked with NSSE to engineer three elevated solar canopies to service Agricultural Irrigation wells, and also creating three residential sub- arrays along with a separate solar project for the Moffitt Walnut Dryer facility. The projects all include the Solar World USA 280 watt mono modules and American Pride Micro-Inverters. These combined solar assets will produce over 180,000 kWh annually and save the business and residences an estimated $35,000 annually in electrical energy costs. The Moffitts Farm excells in producing walnuts, with orchards in Gridley and Chico. This family farm carries on a proud tradition of agricultural leadership. 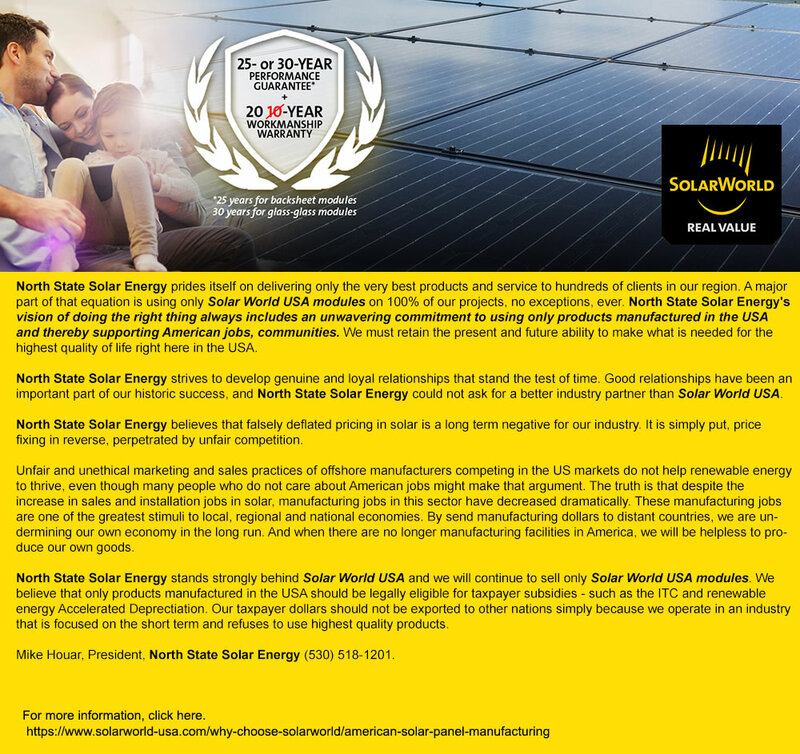 This tradition of excellence is reflected in the renewable energy asset choices they have made- choosing all Made in USA solar products and in working with NSSE as a lifetime energy partner. NSSE is blessed and privileged to be able to serve Moffitt Farms and our many Northern California farming and ranching clients. We have just completed a 30 KW DC solar canopy structure installed and the residence and pasture of the Harthill family of Arbuckle. This system uses our new Chilicon Made in USA Micro- Inverter that performs at a continuous output in excess of 285 watts per unit, paired with 295 watt Solar World USA modules. This project is expected to produce over 44,000 kWh in year one of operation and is combined with a new upgraded service that NSSE performed in conjunction with the canopy and solar work. The Harthill project also provides shade for some of the Champion stock that the family raises in addition to managing a trucking business and farming an orchard. They are hard working Americans who support Made in the USA solar. In our commitment to use only the best American Made products available, North State Solar Energy will be providing our customers with made in USA materials from Outback Power for off-grid and battery installations. The Kaiser Ranch is located in Artois California. Leonard Kaiser farms almonds, prunes, olives and some limited row crops. 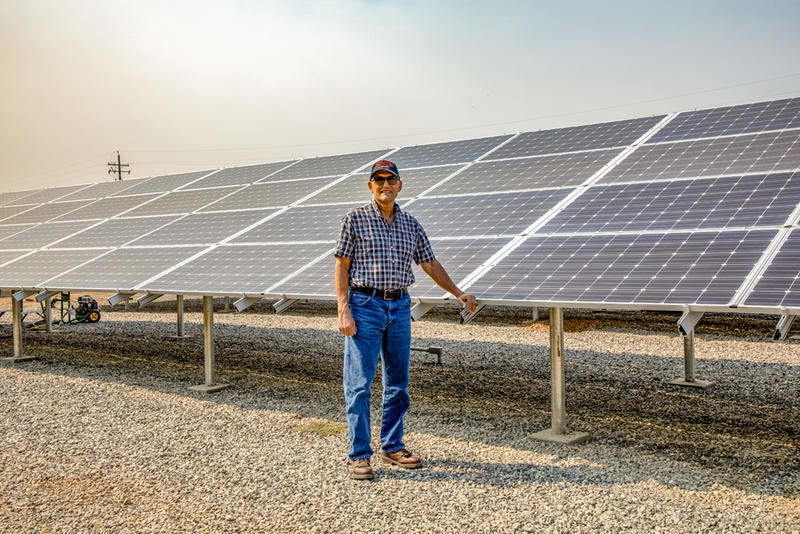 Leonard contacted North State Solar Energy on recommendation from other nearby farms, and he was looking for a way to reduce his ever increasing energy costs. 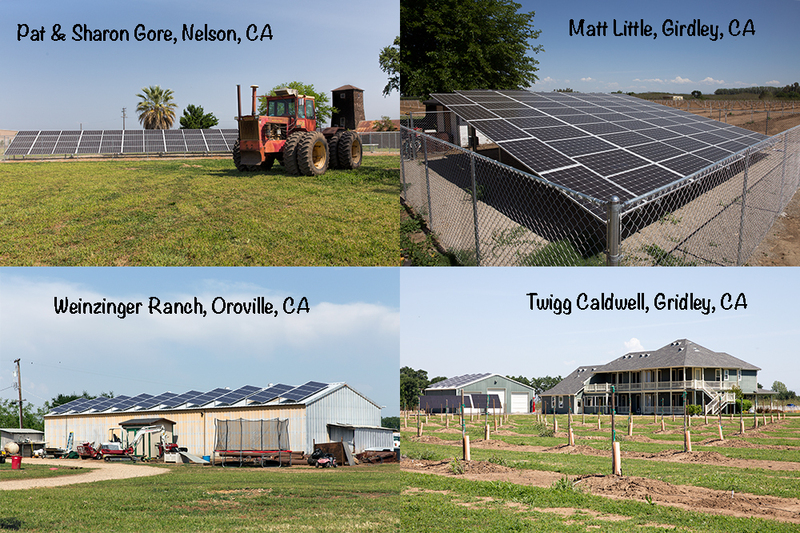 During 2016, North State Solar Energy installed 5 separate solar arrays at Kaiser farm/orchard locations near Artois and Willows, CA. These solar assets will offset an estimated $28,000 annually in electrical costs, and reduce future energy inflation to the lowest possible levels. All of these systems utilized the Solar World USA solar modules paired with the American Pride USA Enphase M 250 micro-inverters. The American Pride inverter is backed by the strongest warranty in the solar industry at 25 years material and labor. 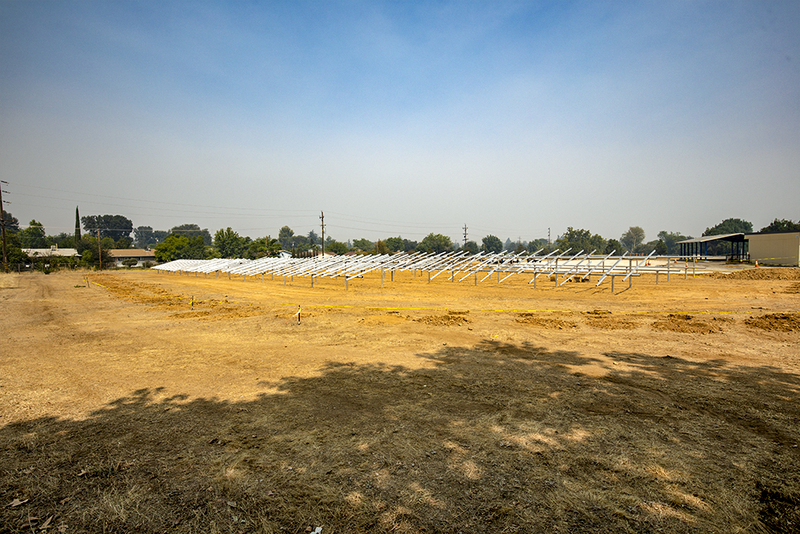 With over 60,000 of these units deployed in Northern California, North State Solar Energy and its clients have yet to experience a single failed inverter. Thanks to Kaiser Ranch for supporting American Made solar products and American manufacturing jobs. Dan Best Ranch in Woodland,California holds a Ribbon-Cutting Ceremony with a Hawaiian Blessing to celebrate the completion of it's solar project. North State Solar Energy receives the American Made Advocate Of The Year Award from Solarworld. 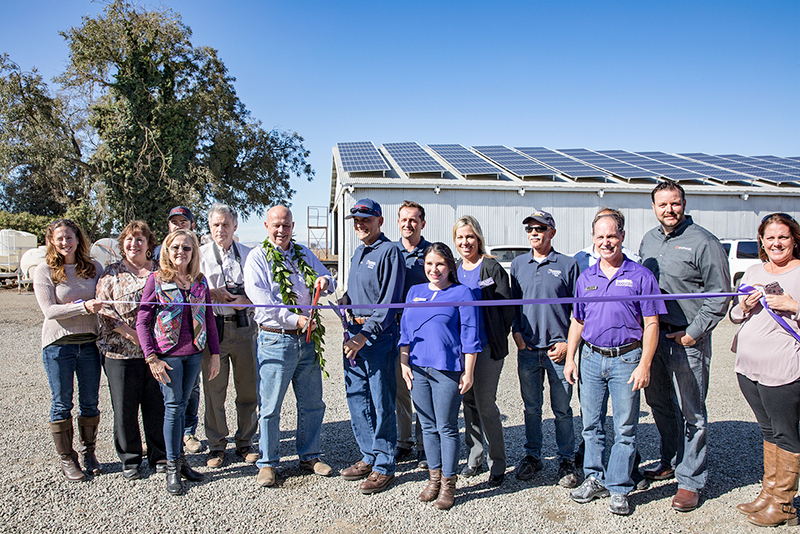 Ribbon Cutting and Blessing to celebrate the completion of 2,077 solar panel installation for the 1,700 acre Dan Best Ranch in Woodland, California. The array includes roof-mounted panels on three large sheds (roof space equal to about three-quarters of an acre), and three clusters of ground-mounted panels (on about 2 acres of land), generating a system total of 577 kilowatts.The Best Ranch installation is said to be one of the largest privately owned microinverter-based solar facilities in the nation. Click here for more information and pictures of the event. Giesbrecht Farms is located in Butte City, California. The farms grows alfalfa, walnuts and almonds. In 2013, the three principals of the farm- Raymond, Carl and Stephen hired NSSE to install residential solar energy systems at their three separate residences. In 2016, the family farm hired NSSE once again to perform an additional four projects. The largest of these projects is a Net Meter Aggregation (NEMA) system that provides 100% of the energy for three 60 Horsepower pumps which serve the walnut orchards. The system has functioned perfectly in year one resulting in a net energy credit to the farm of approximately $140. Under the terms of NEMA, the farm will not receive this credit, however, the farm benefitted from full offset of the energy at these locations, eliminating a cost of approximately $22,000 from the year 2015. NSSE is pleased to work for wonderful people and family farms like the Giesbrechts in our northern California area. Click on the picture above or here for more pictures of the Giesbrecht's Farm in Butte City. Crown Nursery's Chiller and Northern California Headquarters selected North State Solar Energy after interviewing several PV Solar companies from the region. Crown specializes in strawberry planting and the highest quality plants in the berry industry. This focus on quality was a major part of Crown's deciding the premium solar products and service. 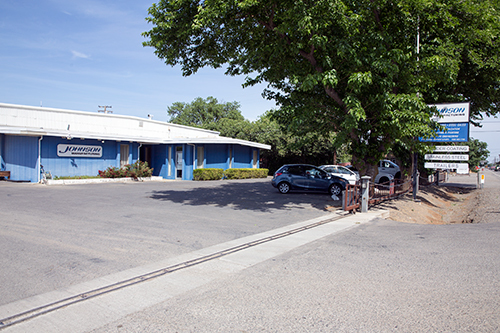 The 199 KW DC project will offset electrical costs approaching $48,000 annually at the office, chiller and shop facilities located on Paskenta Road in Red Bluff, CA. Crown's commitment to American jobs and Made-in-USA products was clear throughout the planning and execution of this project. The project utilizes Solar World USA Mono modules and the Enphase American Pride Micro-Inverters. 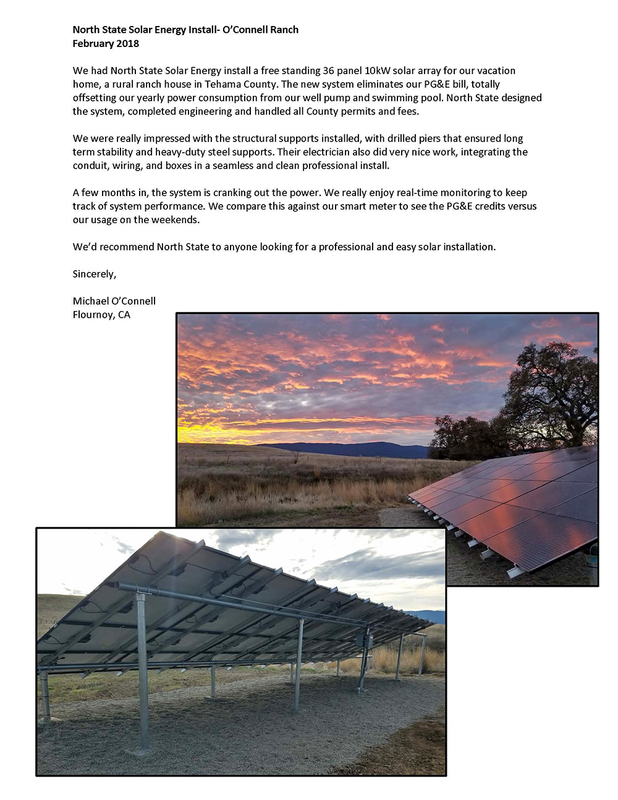 North State Solar Energy was assisted in the challenging site work and significant transmission of energy across long internal transmission distances by Dudley's Excavating Inc., one of Tehama County's leading business and construction companies. Dudleys provided expert directional boring services for NSSE and Crown and allowed Crown's site operations to continue without roadways or parking lots being blocked or disrupted. 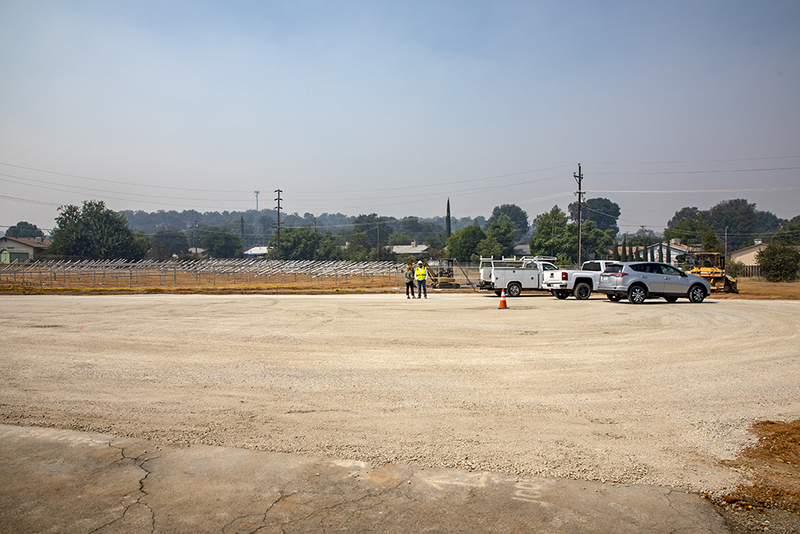 This work is one of the areas that Dudley's Excavating specializes in and provides a major benefit for the energy system owner's business in terms of safety and convenience. NSSE congratulates Crown for choosing the world's best solar equipment, and becoming an American Pride Energy Partner. 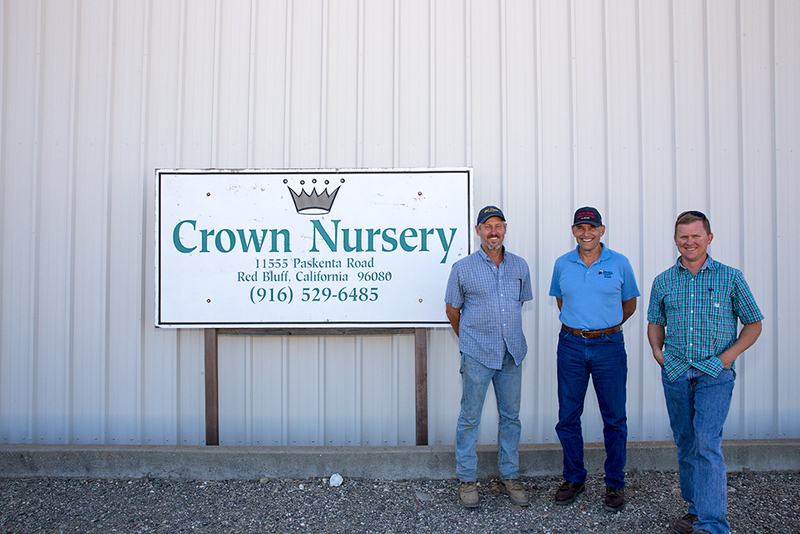 Click on the picture above or click here for more pictures of Crown Nursery. 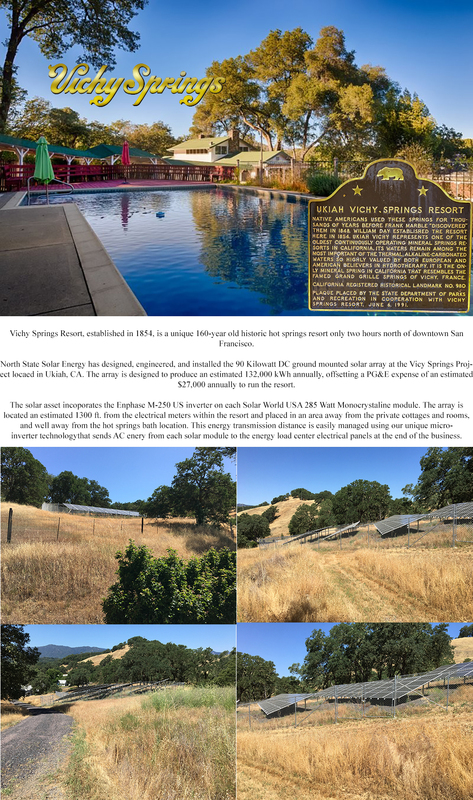 North State Solar Energy has successfully completed the 590 KW DC solar project at the Best Ranch in Woodland, California. Owner Dan Best II has also contracted with NSSE to install a 25 KW DC system at his personal residence. Dan and Best Ranch were strongly committed to using Made In USA products and wanted the assurances of the Enphase, Solar World and NSSE warranties. This system utilizes 2070 Solar World modules, each equipped with an Enphase American Pride M-250 micro-inverter. This system will save Best Ranch an estimated $98,000 in year one of operation at the Ranch. It is divided into six sub- arrays, each connected as an individual NEM project, insuring the maximum financial benefit over a twenty year NEM contract period with PG&E. The sub arrays include three ground mount facilities and three roof- mount facilities. 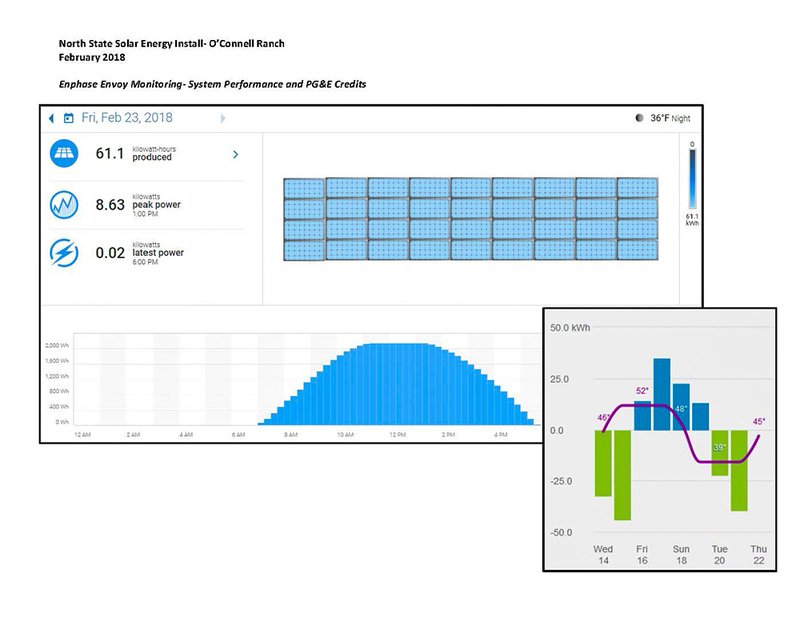 The expected total generation of energy in year one will exceed 870,000 kWh, and will be monitored using the Enlighten internet based monitoring system, allowing module -level reporting and analysis of system operations. This project is one of the largest privately-owned micro-inverter based solar facilities in the United States, and represents a cutting-edge approach to solar design. North State Solar Energy and it's team salute Dan Best and his team and applaud their choice to use American Made Solar. Click on the picture above or here to see more photos of Best Ranch. 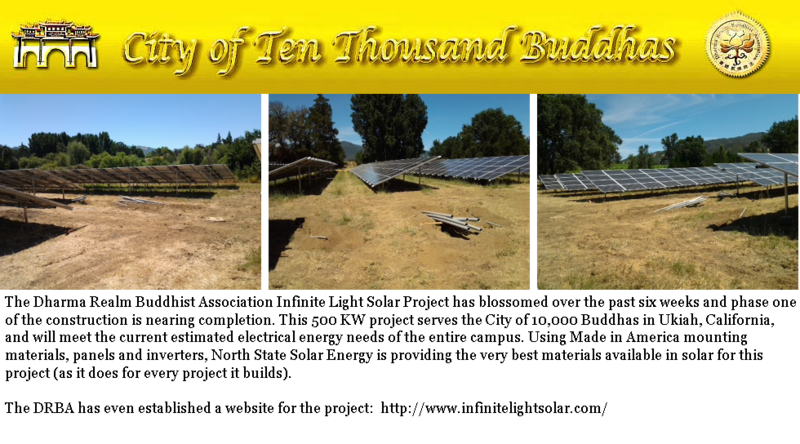 City of Ten Thousand Buddahs holds a Ribbon Cutting Ceremony to initiate it's "Infinite Light Solar Project. 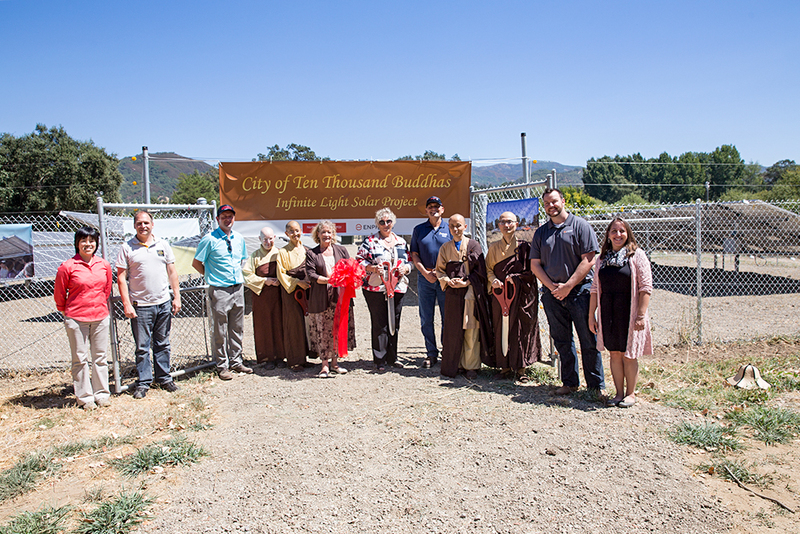 The ribbon-cutting event took place at 1:00 p.m. PDT on Saturday, August 27, 2016 at the solar field at the CTTB campus in Ukiah, Calif. The Program included a chant to dedicate the merit of this project and send good energy out into the world. 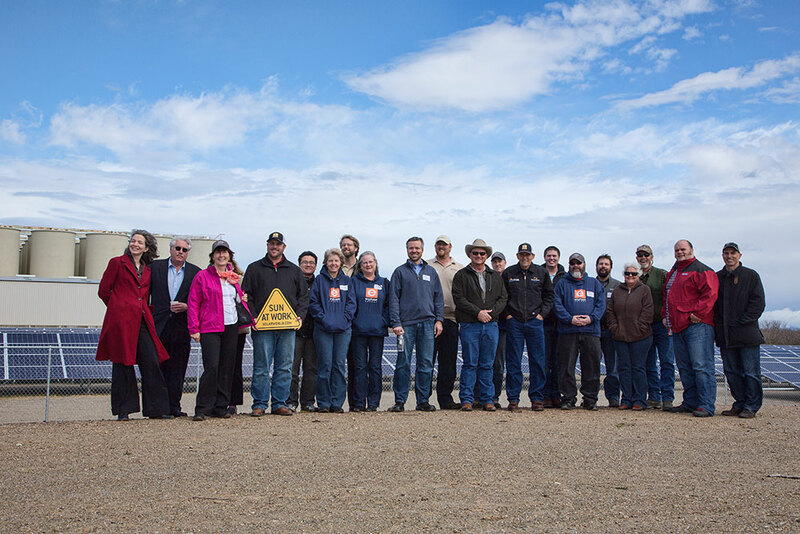 Mendocino County CEO Carmel Angelo and Supervisor Carre Brown participated in the event, along with representatives from Enphase, North State Solar, SolarWorld and the CTTB. Refreshments and snacks followed the ceremony, along with guided tours of the CTTB campus and the project. Pictures of the Ceremony and the Project can be seen by clicking here or on the picture above. Solar Power World, the industry’s leading business-to-business publication, today announced the release of its 2016 Top 500 Solar Contractors list. The Top Solar Contractors list is the most recognized annual listing of North America’s top solar contractors working in the utility, commercial and residential markets. North State Solar Energy has risen to number 71 of the 2016 Top Solar Commercial Contractors nationwide and has risen from number 246 in 2015 to number 187 in 2016 of all Solar Contractors nationwide. Thank you to John Heenan of Live Oak for letting us install his 11 KW (DC) system. More pictures of his installation can be seen here. North State Solar Energy has risen from a rank of 150 last year to being number 100 of the 2015 Top Solar Commercial Contractors. Johnson Manufacturing has operated in Woodland for over two decades. The current owner, Kirk Friedman, researched using solar energy extensively before deciding on North State Solar Energy for Johnson's installation. Kirk is a strong supporter of Made in America products and wanted to use the best technology available. 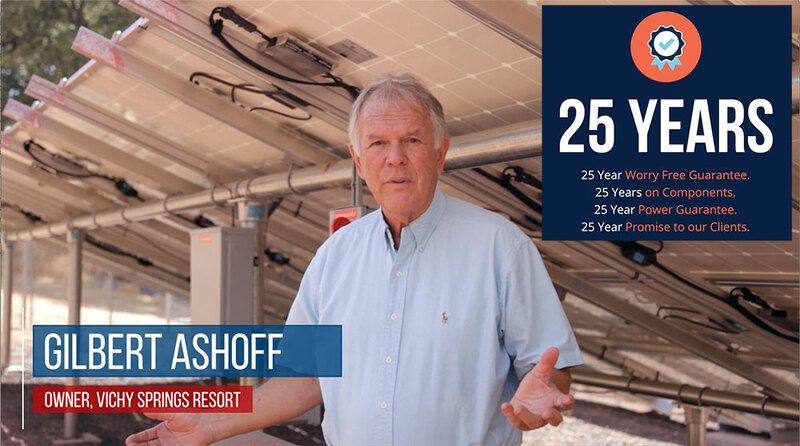 His research indicated that the Enphase American Pride M 250, combined with the Solar World USA module would be the best long term choice. The 51 KW DC system is intended to offset approximately 75-80 % of Johnson's historic energy usage. Total electrical energy cost at the facility prior to installation of solar energy was an approximate $24,000 annually. The array is mounted on the main shop roof, and is oriented south using tilt legs to optimize the solar energy harvest. The micro inverter architecture allows for seamless integration of additional modules to expand the array if desired in the future. Click here or on one of the pictures below to see our gallery of Johnson Manufacturing Pictures. We are pleased to announce that we have just completed another project for Ace Hardware, this time in Cloverdale. The system is a 30 KW Peak shave system. It will offset approx 40% of store energy usage and is designed for expansion using micro inverters.. The array uses Solar World 275 watt mono modules, with Enphase American Pride M 250 micro inverters. It is mounted on Iron Ridge solar racking materials. The solar array at Ace Hardware is impressive at 40 feet in the air. The addition of solar is thought to cut the utility expenses for Ace by 70 to 80 percent. A new 100kw solar array is now sitting atop the Ace Hardware store which will produce approximately 70 percent of the electrical requirements for the 22,659 square foot building. The actual amount produced depends on how much usage. 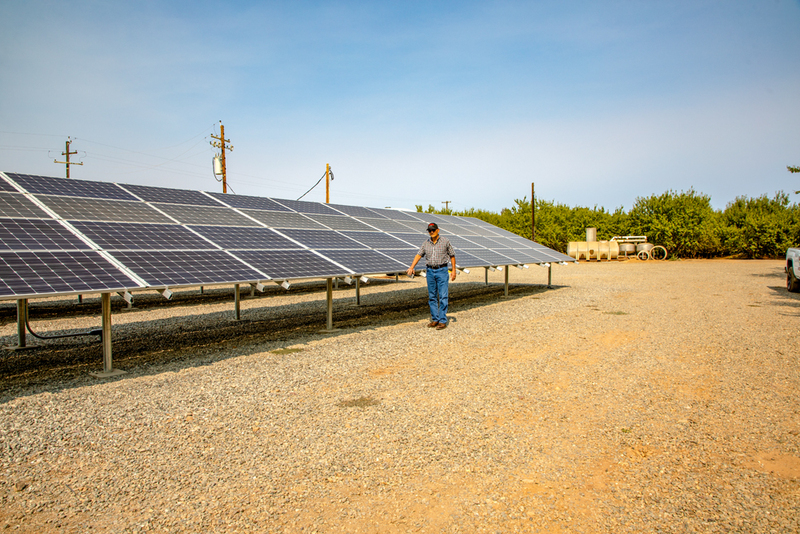 North State Solar Energy uses nothing but equipment made in the United States. 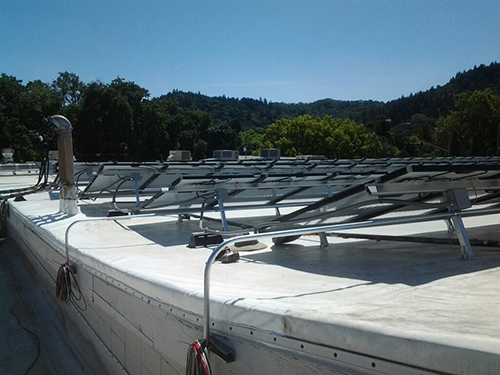 The Solar World panels are made in Healdsburg and the American Pride microinverter is made in Mipitas by Enphase Energy. This is the only microinverter made in the USA. Michael Houar grew up in Fair Oaks and graduated from CSUC in 1978 where his mentor was Professor Rolly Berger who built the first three individual passive solar structures, one at CSUC and two at Chico residences. "Rolly was ahead of his time. He had an ag background, growing up on a farm in Wisconsin. He started his solar work in the 60's. I had the good fortune to know him," Houar stated. Houar kept an eye on solar for three-and-a-half decades before starting his own business. Before Houar started in solar he worked for an electrical contractor firm in Hawaii. Parallel wiring architecture came into the market in 2008 and Houar started in the solar business because he had seen it work. His company is the leading solar company in California and partners with Enphase Energy. There are two types of solar utilization, passive and active. Passive means involving the use of building materials with favorable thermal properties as well as designing spaces while considering the position of the sun. The second type entails encompassing solar energy through heat or electrical power, otherwise known as "Photovoltaic" or PV. PV is the actual generation of electrical power using existing technology to harness solar. This process does not involve harmful by-products such as carbon dioxide, sulphur dioxide, nitrous oxide and contaminated water. Three different collectors help produce solar thermal energy, low, medium and high temperature collectors. In a push for energy and California Solar Initiative, there is a move for the California grid from traditional energy to renewable energy. There are many solar energy incentives across the world but in the United states, the incentives fall under the Securing America's Energy Independence Act and the Energy Policy Act of 2005. Homes and businesses can enjoy tax credits of up to 30 percent through these policies after purchasing and installing various solar energy systems and products. The sources encompass government subsidies to cooperate with utilization that results in complete design of electric grid. Part of the California initiative is to regulate modernization and companies to cooperate with the government and integrate solar into grid so that everybody wins. The City's electric, fire and building departments inspected the finished project giving it the green light. "The City of Gridley Utilities is a leading regulated utility successfully integrating solar coming into total energy supply structure. Keith Gebhardt and Daryl Dye are excellent to work with. The entire team has been extremely supportive and very hands on. They really pay attention to detail, evaluating the affect of these types of systems on their grid to make sure everything is done the right way. They seem to genuinely appreciate that we only use American made products and support the American economy," Houar stated. Now that the work is completed at Ace Hardware, North State Solar Energy is moving on to their next customer, Caldwell Cabinets. Caldwell will have the same size 100kw system installed as Ace Hardware. It is up to the City of Gridley, namely Gebhardt and Dye to carefully evaluate how much solar will be used so as not to have too much solar produced, according to Houar. By the business owners curbing their energy costs, the City works to justify the mutual benefit of solar for the business and their utility part of the City's revenue. The two businesses will still receive some utilities from the City which helps other consumers in keeping their costs lower and significantly lower their cost to replace with clean source of energy as long as the sun shines. Each solar panel used weighs just under 50 pounds which is three pounds per square foot. 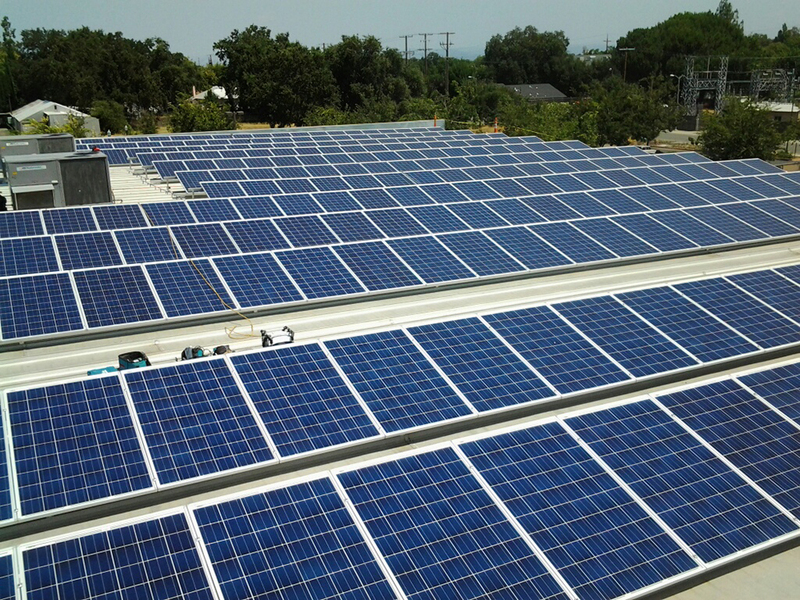 The 393 panels on top of Ace Hardware can be seen from a distance as they face south for maximum amount of solar exposure. The total panel area covers 7,094 square feet. When looking up from the parking lot it is an impressive sight, but even more impressive that each panel has it's own inverter, which means there are 393 inverters for the system to work which is the single most advancement since invented for reliability and safety. Inverters convert the electricity from DC to AC. With an inverter on each panel it means there is no risk as far as fire or electricity. The City's Building Inspector Keith Gebhardt explained that the system is secured to the roof deck with clamps, which means there are no holes through the roof deck so there is very little chance of roof leaks. As the sticker states on the conduit boxes, "Made in the USA," it ranges from 15 to 50 percent more energy than all other systems. Keith and Peggy Harshbarger, owners of Ace Hardware are of course happy with the results and chose North State because they use strictly American made products and offer an excellent warranty. North State can monitor the system over the internet and can come out right away if they need to. “It just made sense for State incentives and trying to save on electricity to keep our business more competitive and keep the costs down,” Keith explained. The couple had been looking into solar since 2005 and 2006 after moving to their new building on the highway. 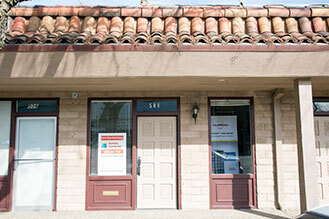 The Harshbarger's recently opened a new store in Suisun which takes more time and effort on their part. This project was one of the 10 largest in this technology type in the state. "Our company has several more planned that are larger in the near future but this is the largest as of right now," Houar explained. 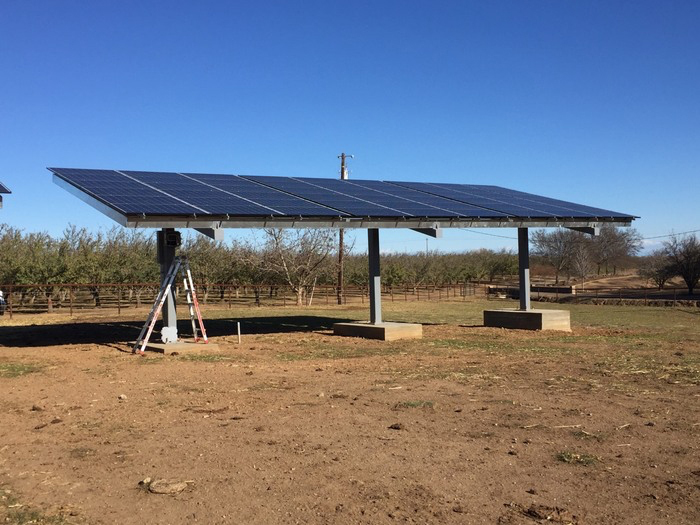 North State Solar Energy put in a 902kw system for the Strain Ranch Orchards in Arbuckle, nine times the size of the Ace project. The company is a member of HGAC, a special government agency program which can bypass RFP's where the Federal Government sets the price on behalf of the consumer. For 35 years, HGAC has offered contracts available to participating members awarded by virtue of a public competitive procurement process compliant with state statutes. North State Solar Energy will soon build solar for El Camino Water District and Indian Valley Water District. What Do Coffee, Beer, and Solar Have in Common? Coffee and beer have been in the news lately — and not for the reasons you might expect. Both of these delectable beverages, which many of us feel we couldn’t do without, are now at risk. Droughts in Brazilthreaten coffee crops, while water shortages around the world don’t bode well for beer, whose main ingredient is water. Climate change is already causing more frequent and severe droughts, and that’s going to continue. So it’s no surprise that both coffee companies and breweries are turning to the power of the sun to help. Park Avenue Coffee in St. Louis, Missouri, recently opened their newest and greenest cafe. Solar providerMicrogrid Solar installed 200 solar panels to enable Park Avenue Coffee to operate the cafe and roasting facility at net zero, providing all electricity for the building. The Microgrid Solar turnkey solar installation provides energy equivalent to powering 206 personal computers and 1547 CFL light bulbs, along with saving 126 barrels of oil. The company’s coffee roaster, produced by Loring Manufacturing, is 91% more efficient than a typical roaster and is completely powered by solar, making Park Avenue the greenest roaster in the Midwest. “We are not doing this for the publicity, we are doing it because it is the right thing to do,” says Dale Schotte, CEO of Park Avenue Coffee. Sustainability was top of mind for both Schotte and Talan Cooksey, Marketing Director, in every step of designing the roasting facility and cafe. From the counter to the windows, the construction relied heavily on repurposed materials. In addition, 80% of trash is recycled and composted. More than one brewery has been realizing lately that beer goes well with solar. 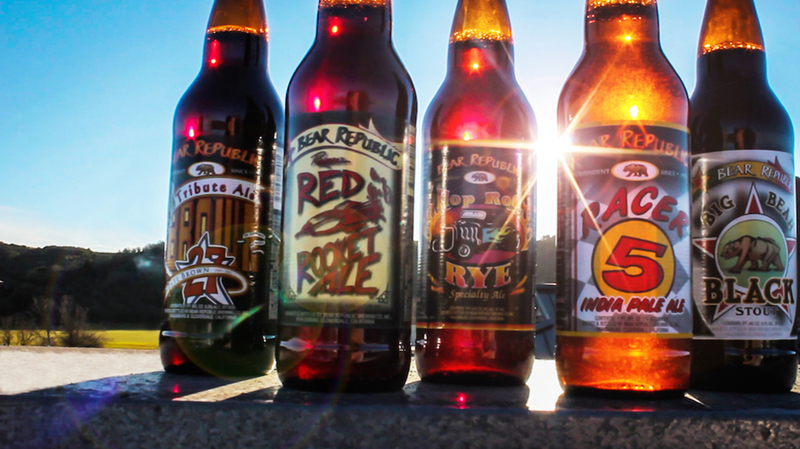 Now, Bear Republic Brewing Company is joining the others. 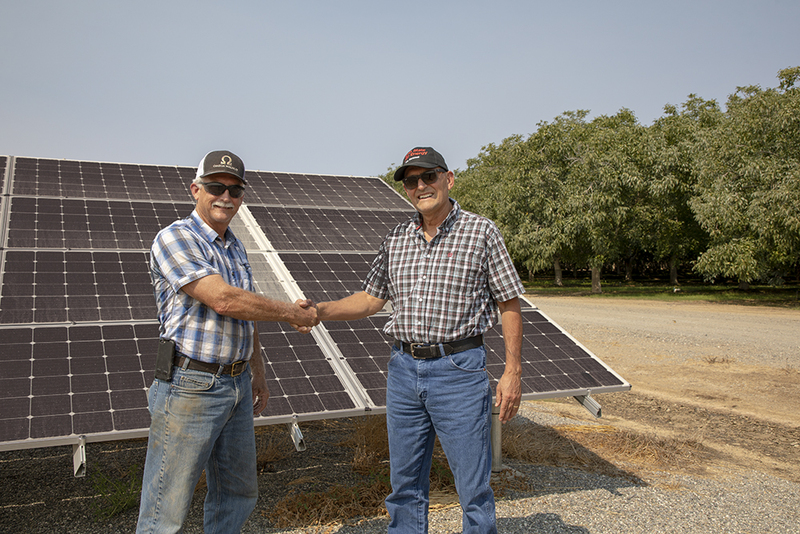 North State Solar Energy, a Northern California general contractor that specializes in solar-electric installations for residential, commercial, and agricultural projects, has installed a PV system at the company’s Cloverdale facility. The system is outfitted with Enphase Energy microinverters. Both the 30.2 kW rooftop solar array and a second, soon-to-be-installed 136.6 kW canopy system feature Enphase M250 American Pride Microinverters assembled in Milpitas, California. The project marks the latest collaboration between Enphase and North State Solar. The solar contractor recently became an exclusive Enphase 2014 American Pride Partner for deployment of Enphase’s new American Pride Microinverters in commercial and residential solar installations throughout Northern and Central California. The solar project is part of a larger sustainability initiative for Bear Republic, which is also implementing technology to treat wastewater from the brewing process while capturing electricity and heat that goes straight back into the production process. 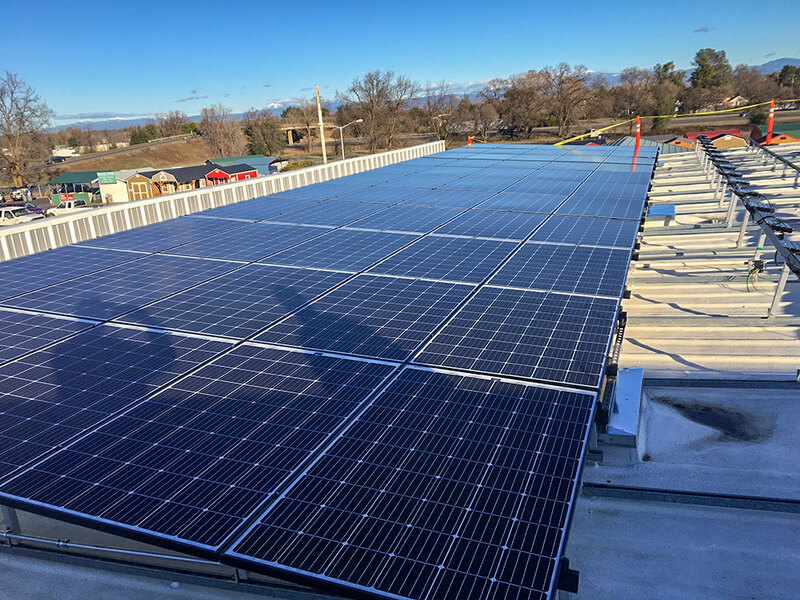 Bear Republic Brewing, a Northern California beer brewery known for its leading approach to sustainable water use has now adopted a rooftop PV system that will zero out its utility use of electricity. “We didn’t do this for marketing, but rather as the right thing to do; we also want to show other breweries that it is a good thing to do,” says CEO Richard Norgrove, in Cloverdale, CA. 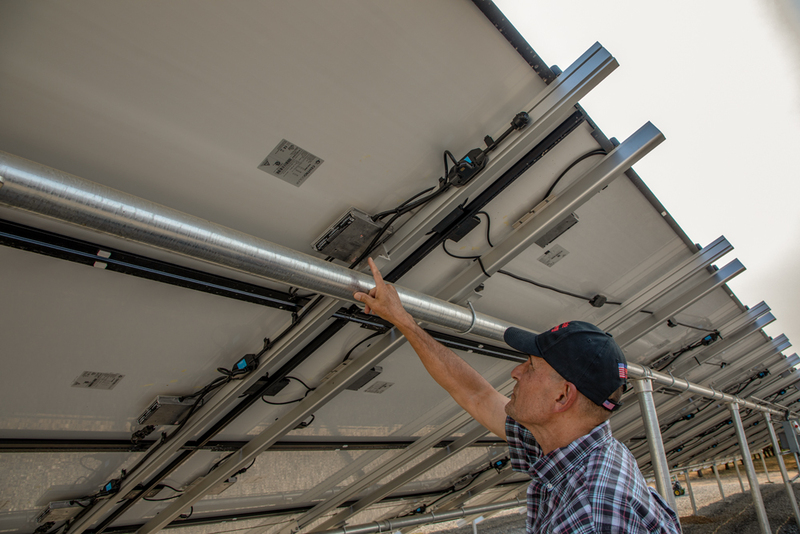 The October edition of pv magazine will feature a feature article on solar brew operations in California and beyond. 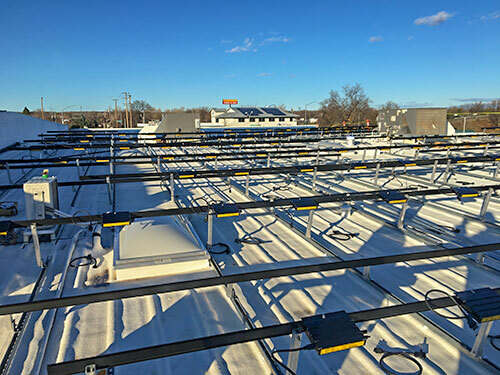 The 30.2 kW rooftop installation over the brewery will soon be complemented with a 136.6 kW canopy, including Solar World modules, Enphase microinverters, IronRidge racking, Erico mounts and Eaton electrical gear. 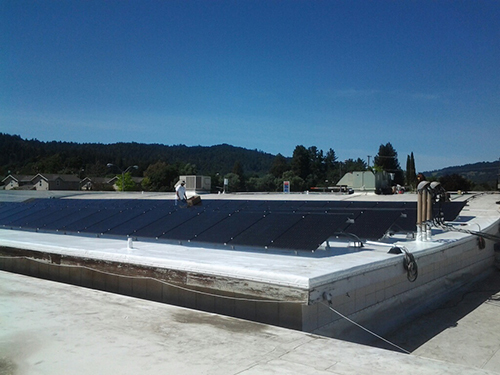 The installation was performed by North State Solar Energy, based in Forest Ranch, CA. North State routinely recommends U.S.-made components to its clients. 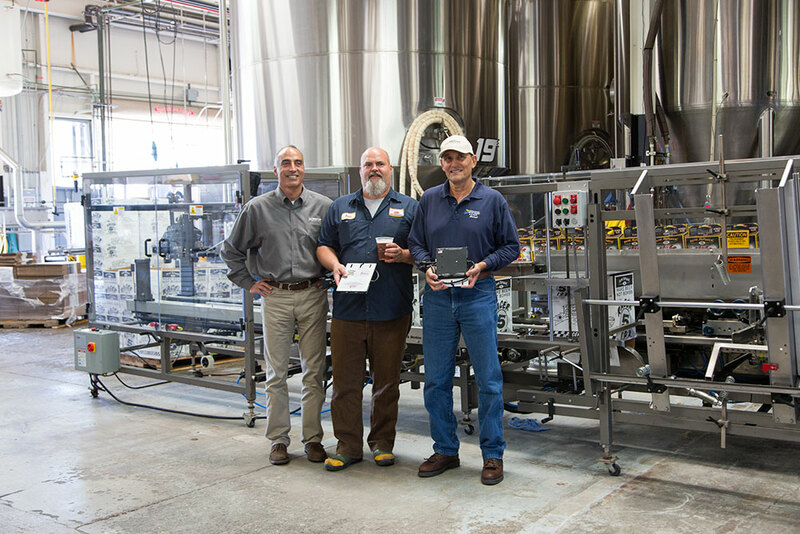 The brewery held a ribbon cutting for the installation on August 28th, with the presence of local officials, and supplier executives, including Enphase’s CEO Paul Nahi, IronRidge’s CTO Craig Carni, Solar World’s Regional Account Manager Franz Feuerherdt, and North State Solar President Mike Houar; beer was provided. The installation is the first in the United States using Enphase’s newly produced American Made line, which is distinguished by being assembled in Milpitas, CA., with enough U.S. parts and labor to meet federal American Recovery & Reinvestment Act (AARA) requirements for domestic content of 51 percent, with associated cost premiums ranging from six percent to 25 percent over imported products. “The CEO of our company says while we want to do the right thing, it doesn’t say ‘Bear Republic, not-for-profit’ on our charter. The economics are finally there, says Master Brewer Peter Kruger, who is a member of the sustainability subcommittee of the national Brewers Association, based in Boulder, Colorado. Apart from its solar initiative, Bear Republic has drilled its own water wells in water-scarce Cloverdale, so that it now supplies 99 percent of its total water use, says Norgrove. “We used to be careless with water, especially during cleaning, but that doesn’t happen any more,” says Kruger. Bear Republic is also involved in food sustainability in the community, having partnered with partner with the Redwood Empire Food Bank of Sonoma County to contribute to the food bank’s Range to Table donation program. The program provides beef for low-income families, senior citizens and others “who would go hungry if not for the food provided,” the brewery states. Bear Republic is donating brewer’s grain to be supplied as feed to Oak Ridge Angus Ranch in Calistoga, CA, which has volunteered to humanely raise calves on open range land. The brewery is noted for having won the Small Brewing Company and Brew master of the Year from the Great American Beer Festival, in 2006. The company also has won 19 medals from the Great American Beer Festival and various medals from the World Beer Cup, Good Food Awards, and the California State Fair. Within the scope of its corporate social responsibility program (CSR), Bear Republic also supports organizations including Rotary, Boys & Girls Club, Kiwanis, Active 20-30 Club, Big Brothers Big Sisters, PTA, Special Education, the Little League, and other small groups locally. PETALUMA, Calif.--(BUSINESS WIRE)--Enphase Energy announced today that North State Solar Energy, a Northern California-based general contractor that specializes in solar-electric installations for residential, commercial and agricultural projects, has installed an Enphase®-equipped photovoltaic (PV) system at Bear Republic Brewing Co.’s Cloverdale facility. 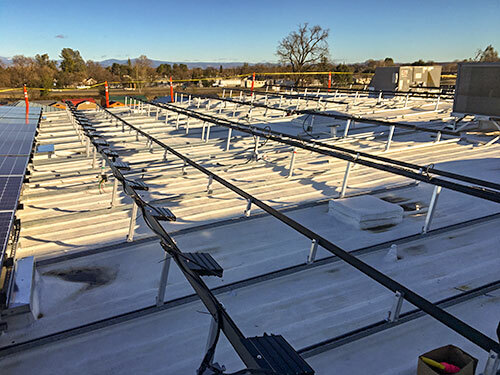 Both the 30.2 kilowatt (KW) rooftop solar array and a second, soon-to-be-installed 136.6 KW canopy system feature Enphase M250 American Pride Microinverters assembled in Milpitas, California. The project marks the latest collaboration between Enphase and North State Solar. The solar contractor recently became an exclusive Enphase 2014 American Pride Partner for deployment of Enphase's new American Pride Microinverters in commercial and residential solar installations throughout Northern and Central California. The solar project is part of a sustainability initiative for Bear Republic, which is also implementing technology to treat wastewater from the brewing process while capturing electricity and heat that goes straight back into the production process. NOTE: A ribbon-cutting ceremony for the Bear Republic solar power system took place on Thursday, August 28, from noon to 2 p.m. at the Cloverdale facility. North State Solar Energy is a Northern California-based general contractor that specializes in solar-electric installations for residential, commercial and agriculture projects. Owned and operated by Michael Houar, a licensed contractor for over 25 years, the North State Solar Energy team has been involved with the design and installation of over 200 solar projects. With a business model focused on delivering long-term quality and value, North State Solar Energy recommends U.S.-made solar and accessory components with high performance and unmatched warranties. North State Solar Energy also has a commitment to providing an unparalleled level of customer service. Visit www.northstatesolarenergy.com for more information. Click here to see pictures from the ribbon cutting ceremony. As of July 1, 2014, Todd Dewey has left North State Solar Energy to pursue other interests. We wish him well in his new endeavors and will miss him. Harshbarger Ace Harware Gridley is located in the heart of the city of Gridley CA on HWY 99. 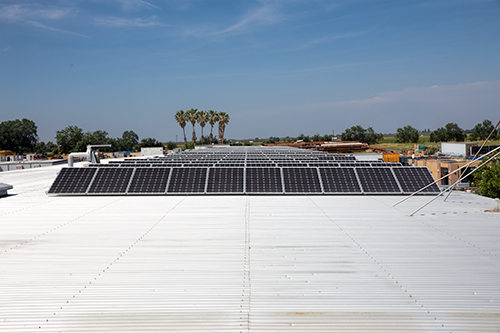 This 100KW project is the largest privately owned PV system in the Gridley Utility District to date, and features the Solar World 250 watt module paired with the Enphase M 250 American Pride Inverters. The project will offset approximately 80% of the historic electrical energy use at the store, owned by Kieth Harshbarger. Kieth is a strong supporter of American Industry and manufacturing, and was referred to NSSE by our good friend and satisfied customer Mr. Gary Kerhoulas. 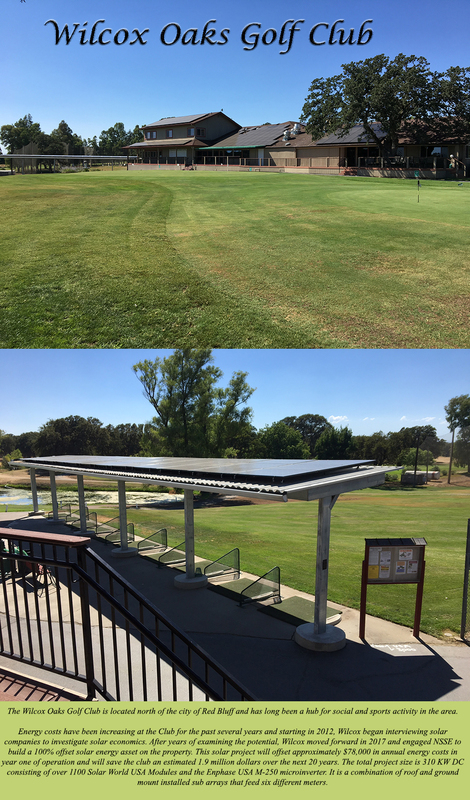 The Balanced Body solar project is a 250 KW system using 500 SolarWorld 250 Poly modules and 500 250 SolarWorld Mono modules in a side by side application. 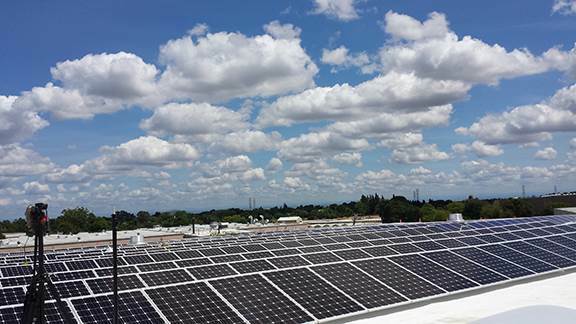 This is one of the largest privately owned solar arrays in the SMUD utility district and is a roof mounted system that will offset an estimated $51,000 in annual electrical costs for the Balanced Body operations. Balanced Body is the world's leading Pilates equipment manufacturer and is a strong supporter and presence in American Manufacturing. 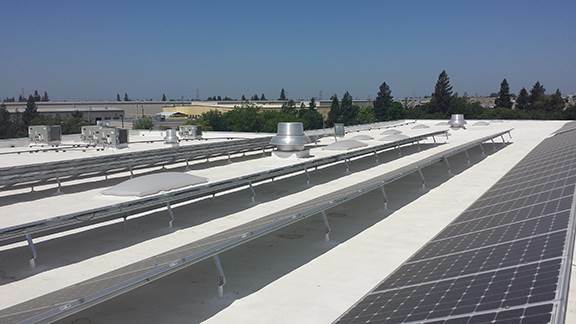 Ken Endelman is the President and owner of Balanced Body and was directly involved in the selection of North State Solar Energy to perform this project along with Poelman Construction, Inc. of Sacramento, CA. Poelman Construction is a leading developer and contractor in Northern California and has managed and built numerous projects in the region. The unique architecture of the Balance Body array will incorporate the Enphase Enlighten Monitoring technology and allow NSSE to harvest data in a side by side production output comparison of the Poly and Mono solar panels. This is a first of its type test bed that Ken Endelman strongly supported in the effort to support the learning curve for solar and renewable energy systems. North State Solar Energy was selected from a finalist list of four firms and won the project as the only firm to offer Made in USA products and micro inverter technology, even though the initial purchase cost for this system was the highest submitted proposal price. 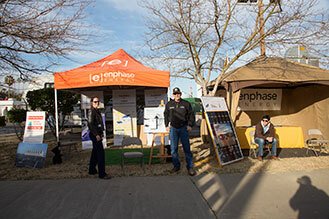 Enphase Energy, Inc. (ENPH) today announced a strategic agreement with North State Solar Energy, a Northern California-based general contractor that specializes in solar-electric installations for residential, commercial and agriculture projects. 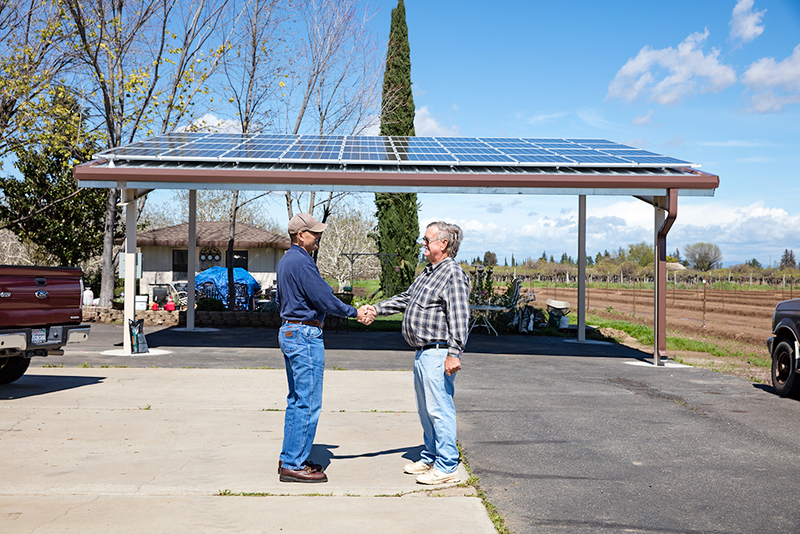 The agreement names North State Solar Energy an Enphase exclusive 2014 American Pride Partner for installation of Enphase’s new American Pride Microinverters in commercial and residential solar installations within key counties throughout Northern and Central California. Solar Builder Magazine announces Enphase Energy's strategic partnership with North State Solar Energy to install Enphase microinverters on California Projects. North State Solar Energy has just completed a 535 kW project at Artois Feed in Artois California which is the World's largest installation using the Enphase M250, the world's most advanced microinverter. Click here to see more of our projects. We just opened a new office in Colusa at 504 Market St. Our hours at this office are 9:00am to 1:00pm Monday through Friday. Please stop by to visit if you're in the area. Thanks to everyone who came by to visit us at the Colusa Farm Show. Our President, Michael Houar shows some our our latest projects and the reasons why North State Solar Energy will provide more value for agricultural, commercial and residential Photovoltaic systems. 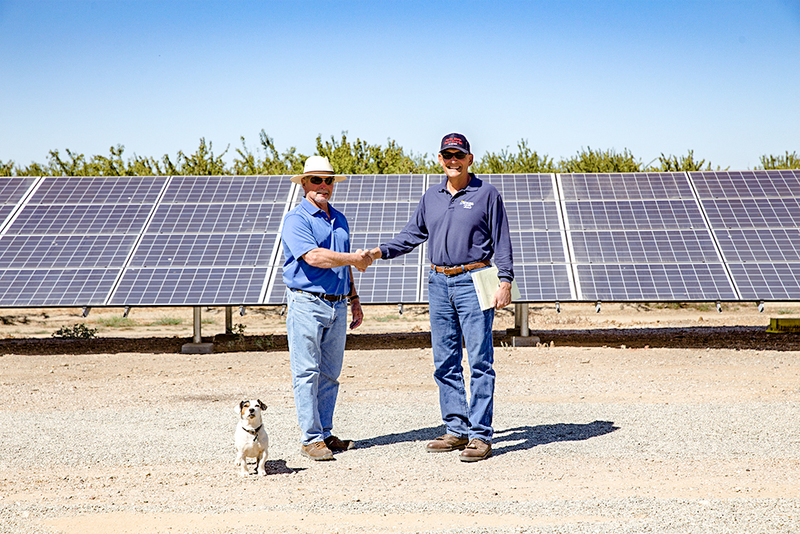 North State Solar Energy is proud to have been selected to install the nation's largest farm-based solar installations at Strain Ranches in Arbuckle, California. The 902-kilowatt array features solar panels from SolarWorld, and micro-inverter technology from Enphase. 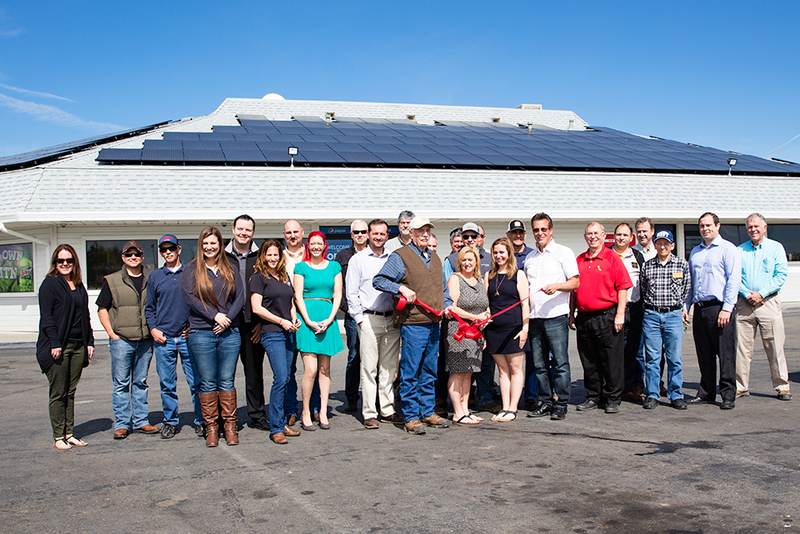 On Tuesday, Feb. 19th, 2013, Strain Ranches dedicated its solar system, highlighting the natural synergy between domestic agricultural and solar production, two iconic American industries. Click here for pictures of the array and the dedication ceremony. North State Solar Energy is a Northern California based general contractor that specializes in solar-electric installations for residential, commercial and agriculture projects. Owned and operated by Michael Houar, a licensed contractor for over 25 years, the North State Solar Energy team has been involved with the design and installation of over 582 solar projects. With a business model focused on delivering long-term quality and value, North State Solar Energy recommends US made solar and accessory components with high performance and unmatched warranties. North State Solar Energy also has a commitment to providing an unparalleled level of customer service. North State Solar Energy provides its customers with Made and Designed in USA premium products that will meet their energy needs, reduce their energy costs and add value to their homes and businesses. North State Solar Energy will uphold the highest quality workmanship, offer an unmatched level of installation service, a superior warranty and bring best value to all our solar and contracting clients. 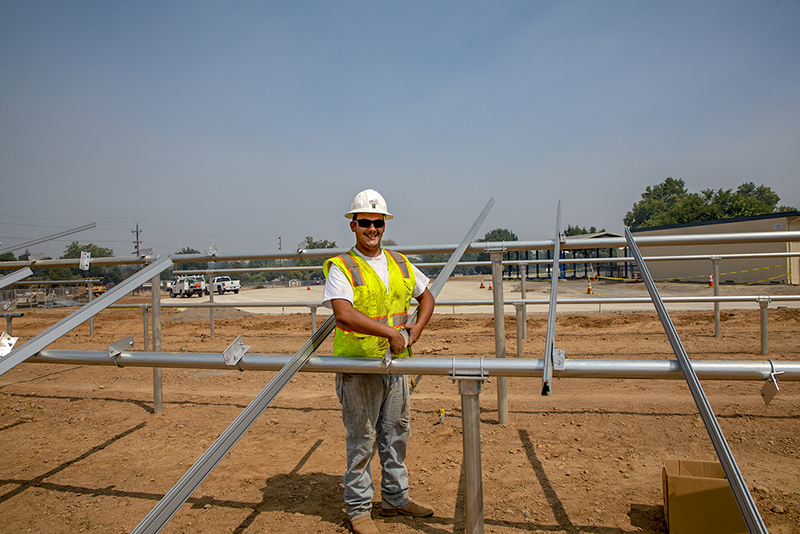 North State Solar Energy uses Made in America products and provides excellent employment experiences for our tradesmen, allowing them to work in a progressive environment and develop their abilities while providing outstanding service for every one of our clients. We manage all projects, large and small with personal attention to detail, beginning with a physical site evaluation and energy use evaluation. We provide alternate recommendations offering our clients one or several methods of meeting current and future/ anticipated energy needs. We provide written proposals and power production projections for all of our clients that are easy to understand and have clearly stated production values. And we back every project with an extensive warranty that offers no excuses and makes no false promises. We will cover your energy needs with the strongest assurances offered in our industry- bar none. We proudly offer Solar World USA modules offering the highest efficiency ratings in the industry, and backed by companies that source and assemble their products in the USA, creating jobs for American Citizens. We specialize in the use of Enphase USA Micro -inverters, industry leading and Made in America Act compliant. We use made in USA racking systems, and provide mounting on shops, businesses, ground mount arrays, and also design specialty projects that comply with local building codes. North State Solar Energy has completed dozens of residential, agricultural and commercial projects ranging from as little as 1.5 KWh to as large as 924 KWH. We work with all types of buildings, and specialize in grid- tie systems that insure our clients they will return a maximum on their solar investments. All building permits, including required engineering and inspections are managed by our firm as a part of this process. All net metering applications and rebate applications with the local utility companies are completed by our staff and followed through to completion by our management. We take the hassle out of the process for you. And you don’t make the final payments until your system is operational. We also provide assistance with the HOA (Homeowner's association approval process). Click here for an example. We offer a range of financing up to one year same as cash, interest free programs for qualified clients. We also offer referrals to local banks and credit unions where we have working relationships. We also provide manufacturer financing and lease arrangements for larger projects and PPA (power purchase agreements). We can assist almost any family or business in obtaining solar energy at the lowest cost per watt and using the best products available. We provide specialty services, including lifetime system monitoring set-up with an internet interface. We construct solar covered structures, including patios, carports, pole barns and tracking solar arrays. We have introduced an affordable cleaning service (for our installations only). We also have a fantastic referral program which allows our clients to grow their array over time at no cost! North State Solar Energy serves the entire region of Northern California and has completed projects in Shasta, Tehama, Glenn, Colusa, Santa Clara, Stanislaus, Yolo, Sacramento, Placer, Plumas, Butte, Yuba, Sutter, Contra Costa, Sonoma, Marin, Mendicino, and San Mateo Counties.